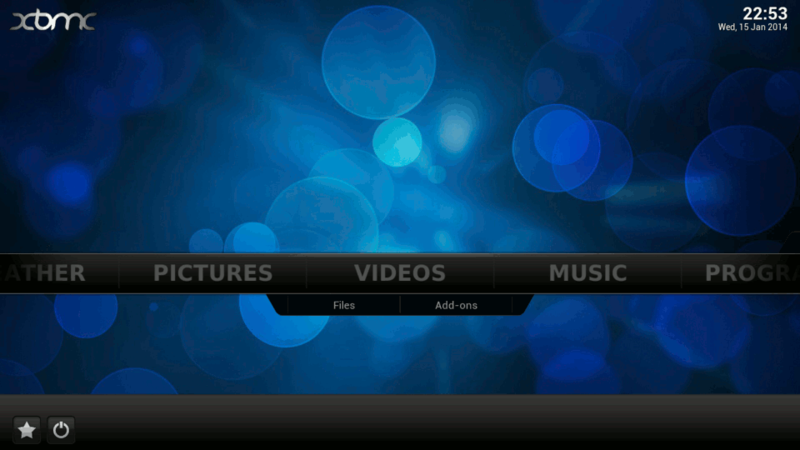 OpenELEC (see wikipedia) is a media player for the Raspberry Pi, based on XBMC (wikipedia). So it lets you play your movies, music and photos on your tv, from local storage like the SD card or a USB hard drive. And of course it can also do the same for network content, like media from your networked PC, or streamed from the internet. This isn't the main reason why I got the Pi, but it provides a quick and easy demonstration of what the Pi can do and show that it's working properly. There are many other alternatives too (notably RaspBMC), but this is the one I tried out. Everything you need is at openelec.tv. In particular, the download for the raspberry pi image is at raspberry-pi-builds and the installation instructions are on their wiki. Basically all you need to do is download the tar.bz2 file, untar it, and then (as root) call the script create_sdcard - it really is that easy. The only thing that confused me was that the instructions then went on to talking about downloading unofficial builds and building the sources yourself, and because what I'd downloaded was only about 90MB, it then wasn't clear whether I'd already got everything or just created an installer which then needed the "real" sources built. But sure enough, somehow they've managed to squeeze it all into such a tiny image. Then just put the SD card in the Pi and boot it. I used a USB mouse (well, actually a trackball) for input, and a tv and stereo for output. I also copied some example media (like movies, mp3s, oggs and jpgs) onto the SD card to try things out. It booted straight into the main menu, which was a good thing because I didn't have a keyboard (I only have a PS2 keyboard on my desktop and can't find a PS2->USB converter). But I found the mouse a great way to navigate the menus. It also works fine with a wireless keyboard, using the arrow keys and enter to select stuff, and typing in search terms directly rather than using the on-screen keyboard. Interestingly, and quite magically, you can also have your tv remote send commands to the pi over HDMI, which makes the Pi virtually invisible - you can select and pause and fast-forward and stop streaming video with just the tv's infrared remote, even though the Pi obviously has no infrared capability. Very cool. The main screen offers the choice of Videos, Music, Photos and so on. There's also a Settings menu for changing the settings, such as time zone, keyboard layout, overscan (for fitting the picture to your screen) and also the skin (for changing the whole appearance of the system). There's even a neat "Weather" function for showing forecasts of your location (presumably gained from IP lookup but also configurable). My temperatures were shown in Fahrenheit by default, but I eventually managed to change this to Celsius, not from the Weather section but by changing the "Region" in the general system settings. The photos are easy enough to view, and there's a built-in slideshow with randomized effects such as zoom and pan. Similarly video files can be easily played back, even .flv files, the only one it refused to play came from mencoder and describes itself as Mpeg-4. I assume this could be fixed with different options to mencoder. Also mp3s and oggs are easily played, no problems. I tried out a couple of the other skins but soon went back to the default one, called "Confluence". Now where things get even more interesting is with the so-called "Add-ons". With an internet connection (in my case with a regular ethernet cable, no configuration necessary), I can choose to install any of the additional XBMC goodies very quickly and easily. Among the video add-ons, notable ones include the Youtube plugin (search by keyword with the on-screen keyboard and play all sorts of youtube videos), TED (similarly search or browse by theme), The Onion and dozens more. The playback worked great, although particularly for TED the time taken to get a simple list of titles was frustratingly long. I have no clue whether this delay was caused by the Pi, by XBMC or by the TED server. Once the videos are streaming though it works great without stutter. Impressive. There's also a great add-on for music called simply "Radio" which lets you choose internet radio stations by name or music category, and store them in a list of favourites. Again, playback works great and there are hundreds of channels to choose from. There are many things you can do with this to make a full entertainment system. Adding videos and tv shows to your "library" lets you organise big collections and add movie information, cover art and so on. Similarly the same for music makes it easier to browse your tunes. You can choose and customise your skin to make it look how you want, and using a remote control or wireless mini-keyboard makes it extremely comfortable to control from the sofa. Plus of course there are boatloads of add-ons of all types to expand the functions, including many online connections such as IMDb, Last.fm, MusicBranz, Pandora, Hulu, Netflix and many more. It's an impressive system. Yet this was just a short try-out to see what the Pi can do. I think it's amazing that the Pi can run this as well as it can, but there are many other things we can try out too. Next stop is running Raspbian, which is a variety of Debian linux, and note that we can also multi-boot OpenELEC using Noobs.